Along with cherry, walnut, and oak, maple is considered to be among the favorite hardwood choices for furniture building. Maple is generally considered to be strong, durable, and pretty when properly finished. Maple does have its drawbacks. It can be temperamental, particularly when finishing, and is susceptible to shrinkage. Making sure that your maple is well-seasoned and properly acclimatized to your environment will make a big difference in how your maple woodworking projects turn out, and how they hold up over time. When buying maple from your lumber supplier, you may hear plenty of names for the wood: tiger maple, curly maple, birds-eye maple, fiddle back maple, red maple, soft maple, hard maple - the list goes on. First of all, soft maple and red maple are typically the same things. The term soft maple is a bit of a comparative misnomer, as soft maple is harder than many other hardwoods (such as cherry). Soft maple is also often referred to as "tiger maple" for the tiger-like stripes in the wood, or curly maple if the stripes are a bit more of the curly nature. Hard maple varieties often will have more small knots that appear along the grain. This is often referred to as "birds-eye maple." For years, maple was the wood of choice for building musical instruments. The term "fiddle back maple" came from this industry, as properly matched boards would be used to make the large back panels of guitars and fiddles. Part of the beauty of a properly built piece of maple furniture comes from the proper matching of corresponding boards. Care should be taken to ensure that grain colors and patterns between neighboring boards should match as closely as possible. Many woodworkers will go as far as to buy thick maple stock and resaw it on a band saw, aligning the cut sides together for a perfectly matched pair of panels. This is particularly effective with tiger-striped maple used on drawer fronts and cabinet doors. Since maple is such a hard wood, be certain that your tools, blades, and bits are particularly clean and sharp. 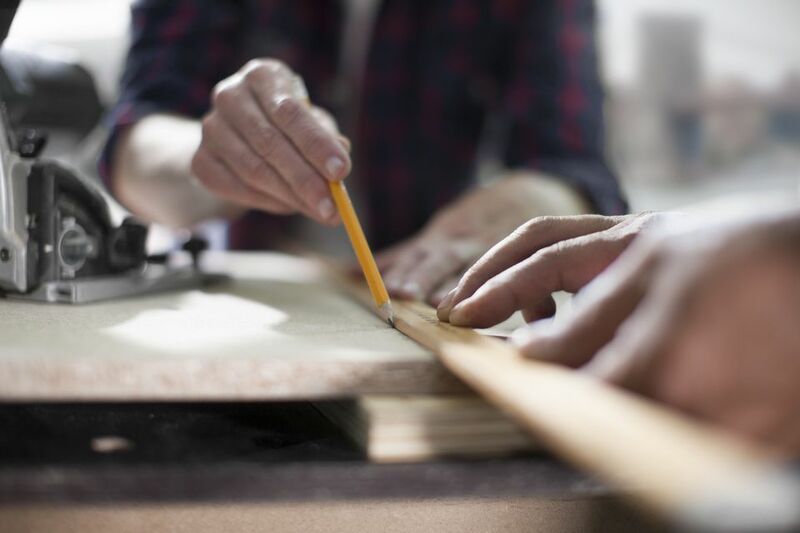 Working with sharp tools on hardwoods is not only going to produce better results, but it is safer than if they are a bit dull, simply because the tools will cut cleaner and be less prone to tearing through the wood. As with other hardwoods such as cherry, maple can be a bit temperamental to finish, particularly when staining. When applying a stain, be sure to use a ​pre-stain conditioner to try and even out the "blotchy" patches that tend to appear. This won't completely solve the problem, though. Stains tend to fill pores, cracks, and crevices in wood. If the stain cannot find a pore to fill, it will be cleared away when the excess stain is wiped away. The key to evening out the stain is to sand the project thoroughly, using progressively finer sandpaper grits. Start with 120 grit before moving up to 180, and finally 220. Try to evenly sand the entire project with this final sanding. Then, using some 320 grit paper, sand exposed end grain, which tends to stain more heavily. Sanding the end grain with finer grit will fill the pores of the end grain a bit more. Lightly wipe down the entire project before applying a pre-stain conditioner, followed shortly thereafter by the stain of your choice. Another commonly used finishing technique on maple is to apply tung oil or linseed oil after the final sanding. These oils tend to bring out the curly or tiger looks of the maple. Follow the oil with a coat or two of shellac. For a more durable finish, top-coat over the shellac with a clear lacquer or polyurethane.